At CodeMakers Club our goal is to have a first-look at how computer programs are made and experience what its like to think like a coder. We will learn the basics of programming (coding) through a series of short lessons and hands-on exercises designed to be fun and challenging. As skills grow, participants will be encouraged to work on their own projects and talk about their ideas. Success won’t be measured by whether a project was finished or not, but by whether we learned something on the way. We will use the programming language Scratch to demonstrate the lessons we are teaching. We may also take part of the week to explore a game or two if they provide opportunities to think like a coder and challenge the kids in new and interesting ways. There will be plenty of breaks from the computer to go outside and have some fun on the playground. 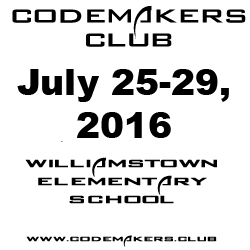 Note: Williamstown Elementary School is not a sponsor or co-sponsor of CodeMakers Club. CodeMakers Club © 2019. All Rights Reserved.